Don Mancini's iconic horror movie series Child's Play is getting made into a TV show. 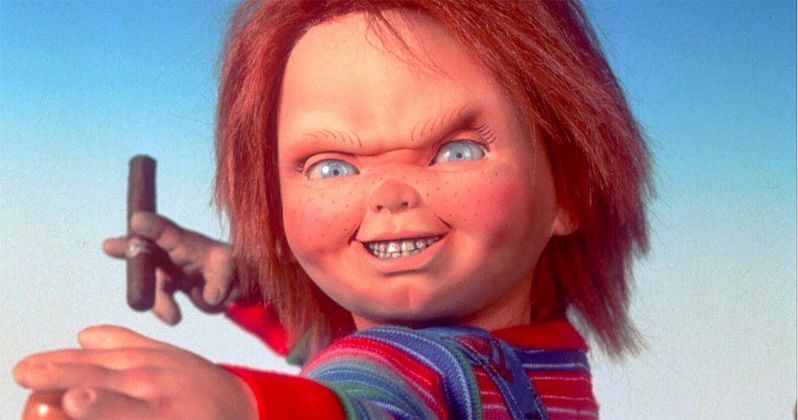 The new show will be based on the red-headed murderous doll Chucky and his franchise from the late 1980s. The franchise originally launched in 1988, and it features Chucky, a child's doll that is possessed by the spirit of a serial killer. There have been 7 movies in the Child's Play franchise released thus far, and more are likely on the way. As for the TV series, Don Mancini took to social media to announce the good news. Don Mancini posted a short teaser for the Child's Play TV series, which just looks like an old TV set from the 1980s. The teaser warns viewers not to not adjust their sets, letting everybody know that everything is going to be just fine. That's all of the info that we have so far. Mancini did not post any further details in regard to the Child's Play TV series, so it's not clear when or where it will air or stream. The idea seems tailor-made for a streaming platform, but we'll have to wait for more news to be revealed. Back in February, it was announced that the Child's Play TV series was in development with franchise creator Don Mancini and producer David Kirschner. Mancini said at the time that he was thinking of having Chucky go back in time to World War II, but he quickly abandoned the idea. It's believed that the show will follow the events of last year's Cult of Chucky, but that has not been confirmed at this time. However, Mancini was aiming for an 8-part series back when he first announced that the idea was being worked on. Since the Child's Play franchise has the rare distinction of never having a reboot, it's believed that the new TV series will follow in the same vein, keeping everything linear. The franchise that features Chucky is celebrating its 30th anniversary this year, so it's highly probable that some more information will come within the next few weeks. However, Don Mancini has said in the past that he wants the series to be "dark, darker than ever before. It's going to be very creepy." That's saying a lot for the Child's Play franchise, which has had its fair share of darkness and creepiness over the last 30 years. Back in February, Don Mancini said that he expects Brad Dourif to return to voice Chucky, which will be pretty awesome if he's able to pull that off. Jennifer Tilly's Tiffany character could make an appearance as well, especially if they decide to make it follow directly after the events of Cult of Chucky. Since Mancini has released a teaser for the Child's Play TV series, it seems that he may have found a place for the horror show. Let's hope more news drops soon. You can check out the Child's Play television show teaser below, thanks to Don Mancini's Twitter account.